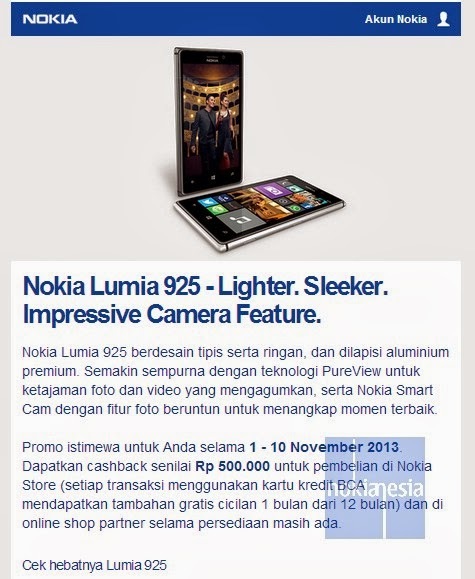 After Nokia Lumia 625 and now it's time for Nokia Lumia 925 to hit Indonesian Market. Start from Friday, 01 November 2013, Nokia Lumia 925 is Available at Nokia Store and selected online shopping Store. Get ready to bring this "Anodized Aluminum" smartphone from Nokia. From 01-10 November 2013, you can get Special Cash back promo IDR 500.000 for every purchase of Nokia Lumia 925 at Nokia Store and selected online shopping store.